Although designs for ITER foresee using both Carbon Fibre Composite and Tungsten as armour materials for the ITER divertor targets, an F4E Task Force consisting of plasma wall physicists and engineers from Europe, USA and Japan, have assessed the option to start operations using a full Tungsten Divertor and have recommended that development and qualification of Tungsten technology for strike point conditions be carried out. A high heat flux testing campaign, aimed at investigating the performances of tungsten armoured mock-ups and prototypes, was therefore launched during the summer. In particular, testing focused on the determination of the Critical Heat Flux value (CHF), i.e. the maximum heat flux that can be absorbed before the components burn out. This is the first experimental determination of such a performance on Divertor Tungsten monoblock components manufactured according to the reference design geometry. The Divertor Plasma Facing components are part of the Divertor system, and as the name suggests, face the plasma in the tokamak. The Plasma Facing component armour tiles protect the copper cooling tubes in the Divertor systems which are used to feed pressurised water in order to absorb the power coming from the plasma. 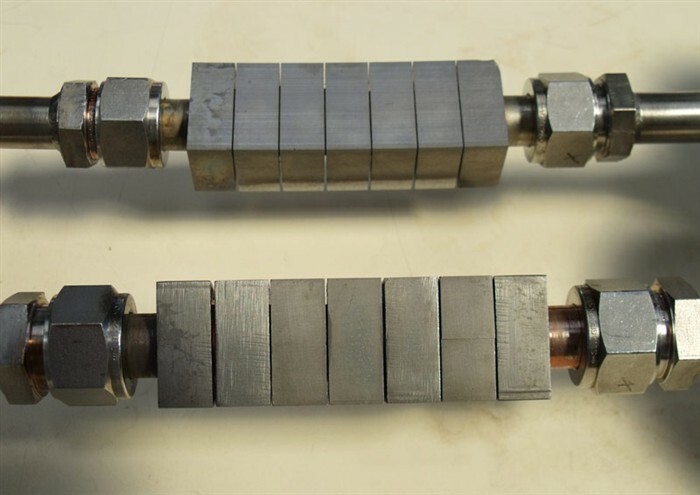 Testing was carried out on three small Tungsten mock-ups each consisting of a Copper-Chromium-Zirconium tube inserted and joined to Tungsten monoblock tiles, in the AREVA FE200 electron beam facility in Le Creusot, France. The mock-ups were manufactured by Ansaldo Ricerche (Italy) by Hot Radial Pressing© and Plansee SE (Austria) by Hot Isostatic Pressing. Only the mock-ups which had the four monoblocks showing the best thermal behaviour during a previous thermal fatigue campaign, were selected for the tests. Hydraulic conditions were set at nominal ITER Divertor conditions, i.e. at a pressure of 3.3 MPa, an inlet temperature of 120°C and a water velocity inside the tube of 12 m/s. A turbulence promoter, which increases the turbulence of the water in order to increase the heat exchange between the water and the heat-sink tube, was used. The power density was increased rapidly until 20 MW/m2, and then by small steps of less than 1 MW/m2. At each step, the power was applied for 30 seconds, and then followed by a dwell time of the same length. For the first mock-up, the testing was interrupted at 27 MW/m2 after it became clear that the Critical Heat Flux value had almost been reached. The second mock-up first sustained 30 MW/m2, but the test was then interrupted because of vacuum degradation in the electron beam gun caused by particles of Tungsten coming from the mock-up tiles. The test was repeated on the same mock-up and finally melting occurred when the power level was above 30 MW/m2. The third mock-up first sustained a heat flux above 30 MW/m2, but again the test was cut short because of vacuum degradation in the electron beam gun. When the test was repeated, the heat flux again reached a value of above 30 MW/m2 before finally being interrupted due to a water leakage on the CuCrZrtube. The conclusive test results for all mock-ups show that Tungsten surface appears to be well preserved up to 27 MW/m2 and that high power induces Tungsten superficial melting. Considering that the ITER requirement on the Critical Heat Flux value for Divertor vertical target is set at 28 MW/m2, these preliminary results are very promising, but because these tests have been done on mock-ups with non-optimised design, improvements can be made. The CHF investigation will continue by undertaking experiments on other mock-ups to enlarge the experimental data base. The experimental results are currently being compared with the numerical analysis. ITER poloidal section showing the First Wall and Divertor system. The Divertor Plasma Facing components are part of the Divertor system, and they face the plasma in the tokamak. The Plasma Facing component armour tiles protect the copper cooling tubes in the Divertor systems which are used to feed pressurised water in order to absorb the power coming from the plasma.